The dog flea (Ctenocephalides canis) is aspecies of flea(Siphonaptera) that lives primarily on the blood of dogs. The dog flea is troublesome because it can spread Dipylidium caninum. They are commonly found in Europe. they can produce eggs. They can deliver about 4000 eggs on the host's fur. The eggs go through four lifecycle stages: embryo, larva, pupa, and imago (adult). This whole life cycle from egg to adult takes from two to three weeks, although this depends on the temperature. It may take longer in cool conditions. piercing skin and sucking blood. Dog fleas are external parasites, living by hematophagy off the blood of dogs. The dog often experiences severe itching in all areas where the fleas may reside. Flea infestations can be not only annoying for both dogs and humans but also very dangerous. Problems caused by fleas may range from mild to severe itching and discomfort to skin problems and infections. Anemia may also result from flea bites in extreme circumstances. Furthermore, fleas can transmit tapeworms and diseases to pets. When fleas bite humans they may develop an itching rash with small bumps that may bleed. This rash is usually located on the armpit or fold of a joint such as the elbow, knee, or ankle. When the area is pressed, it turns white. When dogs are troubled by fleas they scratch and bite themselves, especially in areas such as the head, neck, and around the tail. Fleas normally concentrate in such areas. This incessant scratching and biting may cause the dog's skin to become red and inflamed. eliminate eggs from bedding, grass, floor, furniture and other areas. fleas appear and repeated regularly. 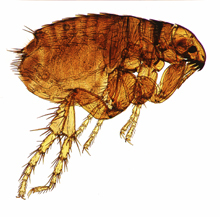 Delays in treating the infestation may lead to flea-transmitted diseases. on the back of the pet and their advantage is that they also provide protection from further infestations. Sprays come in the form of aerosols and pump bottles and they are meant to be applied on all parts of the pet. Dips and rinses are also available but they are not as common as the other such products because they are the most dangerous for the health of the pet. products and released preliminary reports in the spring of 2010. There are also different treatments available for dogs from natural alternatives to chemically-based products that include topical medications and oral medications. Although common remedies provide natural options with natural ingredients such as lavender, pennyroyal, neem, and sweet mace which are insect repellents care should be used since "natural" does not always mean non-toxic. Evaluations of the toxicity of flea treatment products have been scientifically studied and are available online from the Natural Resources Defense Council and a list of less toxic and alternative treatments can be found in the reference book, Flea Control Secrets which maintains a blog specifically on flea treatment. Frontline comes in sprays, drops, general flea medication and other flea control products and it is highly effective. Advantage is a quick-acting topical application product that stops biting fleas in three to five minutes. K9 Advantix not only kills fleas and ticks but also offers control against mosquitoes, biting flies and lice with its waterproof formula. Program comes in pills or liquid and it is taken monthly. It basically kills off the flea's capacity to reproduce which gradually kills off all the fleas. Biospot is an affordable option made to kill fleas, ticks, and mosquitoes. One application lasts about three months for fleas but one month for ticks and mosquitoes. It is not waterproof. Sentinel is a monthly Lufenuron tablet that stops young fleas from molting their outer shells, and makes the females lay eggs that can't hatch. Vectra is a once a month flea and tick treatment given to dogs. It kills all fleas and ticks that stays on the dog for a given amount of time. The formula is waterproof. The dog formula should not be used on cats as it has an ingredient that could affect the cat in negative ways. be difficult but is the most effective way to ensure the dog will not get re-infected. Controlling flea infestations implies not only that the pet has been cured and the fleas living on it are killed but also that the environment in which the pet lives is free of these parasites. And from all these, removing the fleas from the pet is maybe the easiest and simplest step given the many products especially designed to kill fleas that are available on the market. from both indoor and outdoor environments, from all pets and also keeping immature forms of fleas from developing. vacuuming, especially in places where fleas are more likely to be found such as below drapes, the place where the pet sleeps and under furniture edges. It is estimated that vacuuming can remove up to 50% of flea eggs. After vacuuming, one is recommended to use a specially designed product to kill the remaining fleas and to stop the development of eggs and larvae. These products are available on the market and may include carpet powders, sprays or foggers which contain adulticides and insect growth regulators. should be treated with adulticides and insect growth regulators. Cleaning should be done at the same time in the cars, garage, pet carrier, basement or any other place where the dog is known to spend time. eliminating the parasites from the yard or kennel areas, the two places in which fleas are most likely to occur. Dog houses, patios or porches are some of the outdoor areas in which it is more likely to find fleas and those should be thoroughly cleaned. Fleas can also be carried by wild animals such as opossums, chipmunks and raccoons. One is recommended to discourage these wild animals from their property and pets by never feeding them. once-a-month topical, dog collars, sprays, dips, powders, shampoos or inject able and oral products. All these products contain an insecticide as an active ingredient which kills the fleas when coming into contact with them. Fleas absorb the insecticide which either paralyzes them or kills them. still exist around the house or on the pet. The life cycle of fleas can take up to six months and that is why it is recommended to keep up with the prevention measures for as long as half a year. protect your dog from the threat of ticks. Ticks are parasitic arthropods that feed on the blood of their hosts. attach to a host for a blood meal (and must do so on order to mature). bacteria and disease containing materials to be injected into the site. this is normal. If bleeding occurs, apply light pressure to the area. occurs, as identification may become necessary. become alarmed. This should fall off eventually and rarely causes complications. its host – a tick will not voluntarily detach until its meal is complete. DO NOTapply hot matches, nail polish, petroleum jelly, alcohol or other chemicals to the site. These methods are not affective and can actually be harmful to your dog.